Ever since it was formally named and described back in 2008, the beach-ball-sized Late Cretaceous frog Beelzebufo (B. ampinga) has fascinated scientists. The fossil record of frogs (Order Anura), is very poor, although these small, usually unobtrusive creatures have a long evolutionary history. Imagine the surprise of palaeontologists when they discovered the fossilised remains of a 68 million-year-old monster frog in Upper Cretaceous deposits in Madagascar. It had been speculated that this huge frog could have eaten small dinosaurs. Writing in the scientific journal “Scientific Reports”, a team of researchers including scientists from the University of Adelaide have concluded that “the frog from hell” had a strong bite capable of tackling relatively large prey, including, potentially, reptiles, birds and mammals. 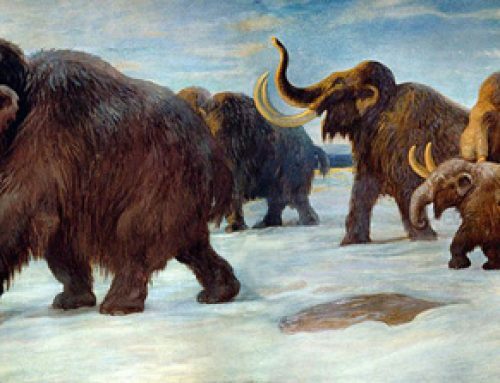 Small dinosaurs and juveniles of larger species of dinosaur could have been on Beelzebufo’s menu! The vast majority of the frogs and toads alive today have relatively weak jaws. Most of these amphibians specialise in attacking prey much smaller than themselves such as insects and slugs. However, one living group of frogs, the South American horned frogs (genus Ceratophrys), are an exception. These large-mouthed frogs have voracious appetites and their comically big heads allow them to tackle much more substantial prey items. 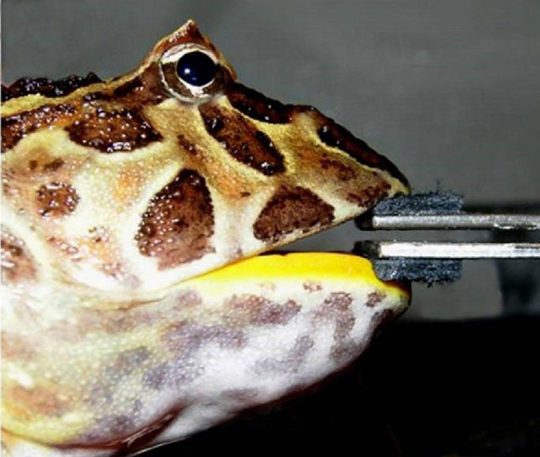 By scaling up the bite force readings from these types of frogs, the researchers concluded that a frog the size of Beelzebufo could have had a bite force in excess of 2,200 newtons, that’s about twice as much force as a typical adult human can generate when the force of the bite from their molars is assessed. An individual Ceratophrys cranwelli biting a force transducer. The study found that small horned frogs, with a head width of about 4.5 centimetres, can bite with a force of 30 newtons (N) or about 3 kg of pressure. When these readings were scaled up to take into account much larger extant species, such as the horned frogs from South America, the researchers concluded that for frogs with a head width of around 10 centimetres a bite force of almost 500 newtons could be generated. Based on their scaling data, the scientists estimated the bite force of the giant extinct frog Beelzebufo may have been up to 2,200 N, comparable to formidable mammalian predators such as female tigers and wolves. Corresponding author for the scientific paper, Professor Kristopher Lappin of the Biological Sciences Department, California State Polytechnic University, (California), outlined how the study was undertaken. The scientists managed to persuade their amphibian subjects to bite down onto leather straps attached to a custom-made force transducer. This device provided an accurate measurement of the amount of force being applied by the animal. It seems those assumptions made by the original researchers back in 2008 were right, based on this evidence Beelzebufo would have been more than capable of snapping up a small dinosaur for dinner.